The conventional strategies for attracting visitors are search engine optimization (SEO), social networking etc are time consuming, needs technical knowledge and need additional push. We have developed a strong platform to address the current gap in SEO though Rapid Developer Content Management Server (RdevCMS™) to save time and money. RdevCMS™ platform provides speed in development, deployment and management. We have combined the results of our experience and investigation in website creation and methodologies to produce a set of new platform and techniques that are geared toward optimizing the process of developing and managing SEO enabled sites. The result of this effort is RdevCMS™. There are two sides to RdevCMS™ Server. On one hand, it has a collection of features that can be implemented through Rapid Developer Engine (RDE) to quickly author multiple SEO enabled sites to display and manage dynamic content. On the other hand, its powerful content management server provides features to capture data through user interactions and transform it to meaningful information for analysis. Develop multiple dynamic sites around an e-commerce site with an unmatched pace. Allows updating and managing content on multiple sites with a blink. Each site created following SEO standards and is SEO friendly. Keep track and repository of affiliate links globally across one or more companies. 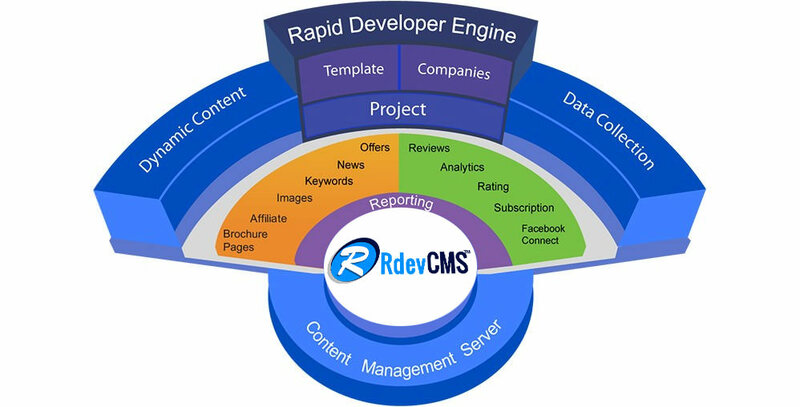 RdevCMS™ offers features to users, which captures data to perform analysis on the site performance.